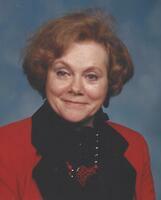 Provide comfort for the family of Evelyn Broussard with a meaningful gesture of sympathy. Evelyn Gertraud Broussard, 93, a resident of Lake Charles passed from this life on March 18, 2019 surrounded by her family. Mrs. Broussard was a loving mother, grandmother, and friend. She lived an extraordinary life. Evelyn was born in Germany in 1925 and survived World War II. She lived in a refugee camp in until she immigrated to the United States in 1946. She then married the love of her life, Roy, J. Broussard in 1948 after being set up on a blind date. She worked at Muller’s Department Store in Lake Charles before leaving to care for her growing family. She was very artistic, loved cooking, entertaining, and traveling the world. She was a devout Catholic who converted to Catholicism before marrying Mr. Broussard. Mrs. Broussard is preceded in death by her parents Friedrich and Elly Richter and husband, Roy Joseph Broussard. She leaves to cherish her memory her loving children, Bill Broussard and wife Marguerite Corbello, Deacon Pete Broussard and wife Mimi, Jack Broussard and wife Wanda, Elly Bercier and husband Rick, Kathy Rock, Tom Broussard and wife Dannie, Angela Lemaire and husband Todd, and Gigi Gruspier and husband Jeff, twenty-nine grandchildren, and twenty-six great grandchildren. The family will receive friends from 5:00 PM until 8:00 PM in the chapel of Lakeside Funeral Home Friday, March 22, 2019. A rosary will be prayed at 6:00 PM. Visitation will continue on Saturday, March 23, 2019 at 8:00 AM until time procession to the church. Mass of Christian Burial will be celebrated on March 23, 2019 at Our Lady Queen of Heaven Catholic Church at 10:00 AM. Rev. Rommel Tolentino to officiate and will be assisted by her son Deacon Pete Broussard. Burial will follow in Consolata Cemetery. A special thanks to Betty Fontenot, Tammy Fruge, Donna Suarez, and Renee Bailey for the excellent care and compassion shown to Mrs. Broussard. 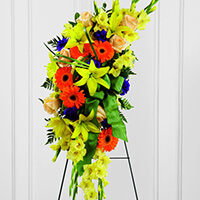 Eric, Anadarko Petroleum Corporation, and others have sent flowers to the family of Evelyn G Broussard. We're gonna miss you grandma. Your optimism and funny outlook on life will be missed. I so enjoyed the times Evelyn and I spent together. My love and prayers to the family. You all are in my thoughts during this trying time. I wish I could be there. Eric purchased the The FTD Heaven's Light Standing Spray for the family of Evelyn Broussard.